Novelty over sized items were always cool as a kid. I always wanted one of those giant pencils or crayons. I have a feeling that they were plastic and you couldn’t actually write with them. Although a giant Sharpie® would come in handy if you won a contest that gave you one of those giant checks. A few comics back I mentioned doodling during meetings and someone requested that I post some of them. Check them out here. I had a novelty pencil, except it broke and I couldn’t sharpen it. I’ll miss that pencil. I tried one of those big pencils, and I found it was more of a hassle than it was worth. Nowhere to keep it, for example. I had a couple of giant pencils as a kid–you could definitely write with them. I was, however, much too small to do it without smacking myself in the face. Yes, but is it only a stop gap measure, or does it give them a real personality? I used to use a giant pencil and giant pencil sharpener all of the time. It hat multiple uses. write. slide things toward me that would otherwise be out of reach. beat people into unconsciousness. ah… good times. This is GENIUS. The visual gag is intricate, but so tightly executed. Chris, even among all your consistently-solid Biff cartoons, this one stands out. It’s just plain phenomenal. Another uncommon use for a common household device! Well, OK… Flamethrowers *aren’t* common… Except in BiffWorld! I never really got into the “oversized item” thing. It seemed like too big a hassle. @Chivalrybean – I thought Thor was the one with the hammer. lol, I guess Biff has been stealing office supplies from the giants again. wood never cease to amaze me. 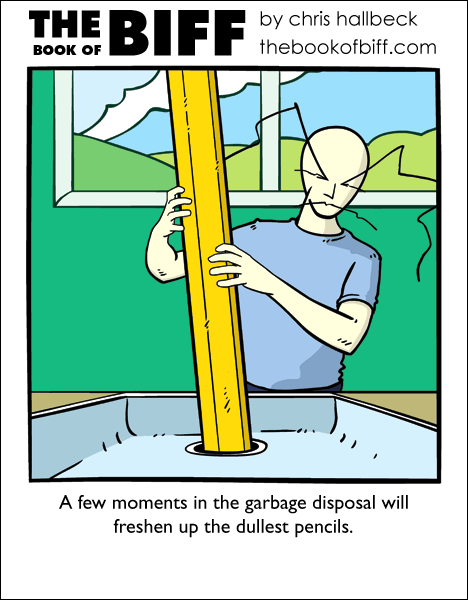 Heh, he could use the pencil shavings as mulch, if he felt like fishing them out of his grease trap. @Seraphine – If you got it, flaunt it. Oh, the places I could take the carpentry comments… 😀 Mercifully, I shall refrain. We’ve got one of those pencils lying around. I keep it stashed on the top of the blinds at the kitchen window, nearest the front door, as a means to stake any vampire that might be polite enough to enter through the front door. Also, it writes just fine, however it’s several (10-15+) years old so the eraser no longer works. Oh well. It’s still a great antivampire security device. Yeah, Thor has the hammer, but this hammer just has the Silver Surfer on it. It is proudly displayed on the bottom of some paper bag in a closet somewhere. I think we got ourselves another theme week! so thats how they charpen those giant things. I have only ever had the unweildly giant novelty pens, the ones that are roughly the size of your forearm except for the tiny, tiny tip.